The Blog Module has all the tools you need to create and maintain a first class blog. This manual will guide you through the features so you can start blogging. To access the Blog Module, click on the Modules tab in the left side navigation of your Site Dashboard. If you have the Blog Module installed on your site, you will see Blog in the left side menu. Click that and you’ll see three options: Posts, Categories, and Authors. You can access the posts context menu by clicking the menu button on the right side of the post item. From the context menu you can Edit, Duplicate, and Delete your post. When you click "Add New" in the top right, you'll be asked to fill in the content and options for your new blog post. This option is checked by default. If left checked, this post will be visible to all users on the front end of your site. If unchecked, the post will only be accessible by going directly to the URL of the post. This is a date and time picker that allows you to choose the date and time that this post will actually be published to your blog. This feature is useful if you want to write a few blogs at one time and spread out when they actually post to the blog. This is the name of your post. This is the main content of your blog. You are provided with a WYSIWYG text editor in which you are able to type and style text, include headlines and subheadlines, as well as insert images. This blog summary input allows you to write a short description of the blog that will be used on the blog list page. This option allows you to choose one or more Categories for this post to appear in. Simply choose the Category from the dropdown list. If you want to add the post to an additional Category, click the "Add Another Category" button and another dropdown will appear. Tag your post with keywords. 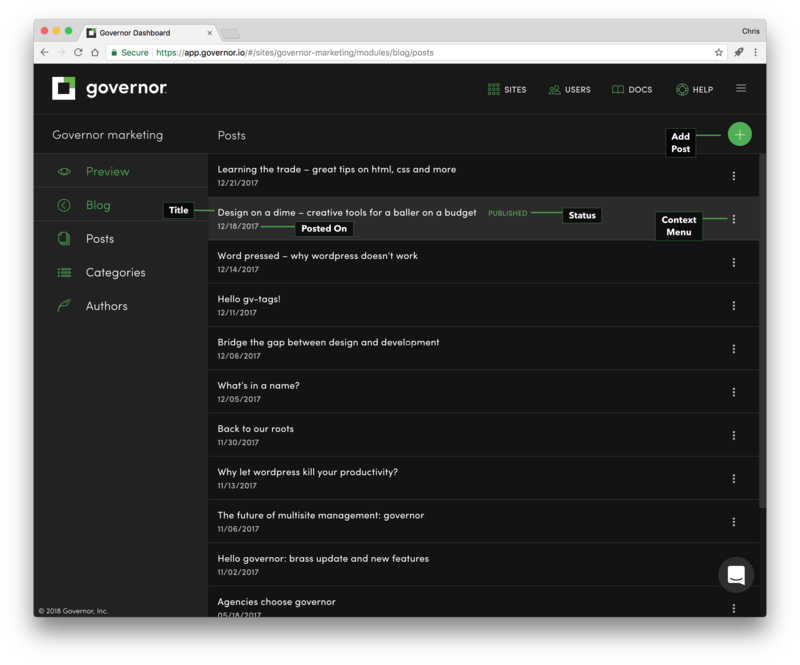 This will help with searchability, both on the front end and in the Governor back end. Upload images to your blog by using the Media Module. Any place where an image tag is placed will allow you to choose an image from your Media Module. To learn more about the Media Module, read this User Manual. You can save your post as a Draft, or you can publish it immediately to your blog. The latest saved version, whether a Draft or a Published version will be saved to the Revisions section at the bottom of the page. Any of these revisions can be restored at any time. The Categories tab will show a table of all Categories that are currently active on your Blog. You will be able to place any of your blog posts into these categories. Click the Add New button in the top right. This will allow you to add and name a new Category. You can rename the category by clicking the "Edit" button n the right side of the Category row. Click the Delete button to the far right of the Category row to remove the category. Removing a category here will also remove it from the front end and the category will no longer show as an option in Governor. Any Blog Posts that are only part of that category will consequently be uncategorized on the front end. You may have different users you'd like to give access to write blog posts. You can do so in this section. Click on the Authors tab in the left side navigation. You will be presented with a table of your current Blog Authors. Click the Add New button in the top right. Fill out the authors name and bio information. Click the Delete button to the far right of the Author row to remove the author.